Working on another text edit. Not enough done yet to justify posting though. Found something worth mentioning in “Support Stat Boosts”. Edit: It appears that this may also be an issue with the base Japanese text, should set and fix for both. I don’t know if somebody has reported this before, but I think the Battle Screen editor has some issues. 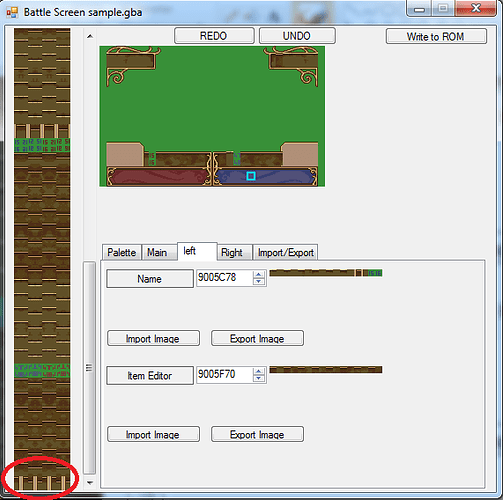 Note that the tiles labeled 15 and 16 are in fact the first two tiles of the Left Item Editor image, the actual tiles 15 and 16 are totally skipped. The same for the last two tiles in the Right Name image, which are labeled as 47 and 48. In total there are 4 tiles that are being skipped. And the tiles in the red circle produce garbage when are used in the screen. Also, it would be nice if this editor had the option to enlarge the canvas. It’s really tedious to place tiles so tiny, especially if you are working from scratch. I fixed both of them. I implemented the zoom function. Note that the tiles labeled 15 and 16 are in fact the first two tiles of the Left Item Editor image, the >actual tiles 15 and 16 are totally skipped. The same for the last two tiles in the Right Name image, >which are labeled as 47 and 48. In total there are 4 tiles that are being skipped. I have to investigate a little more about here. 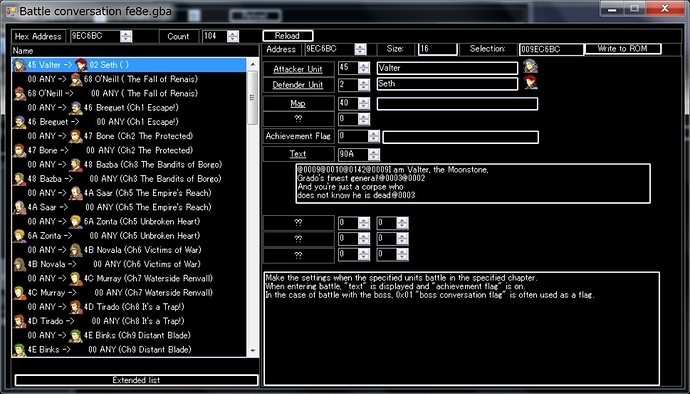 Battle animation has a data structure specially. It is separated into 5 spaces. Each of them holds data like TSA. In theory, I believe that extra areas you pointed out must be available. However, it may not be available for some reason. 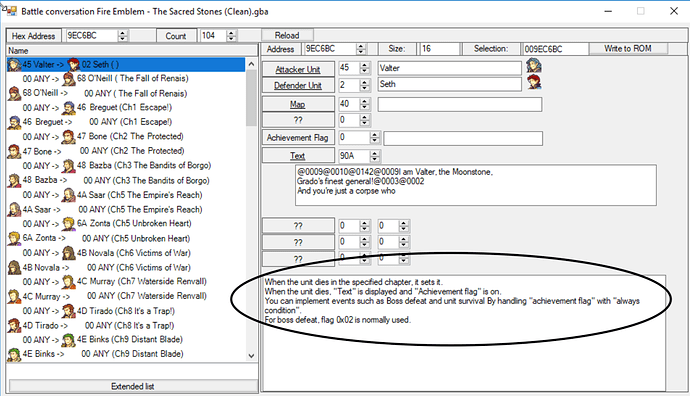 I have to investigate whether this is true not only for FE 8 but also for FE 7 and FE 6. If it is an area that can not be used as well, I will delete that portion. It is mysterious why it can not be used. However, it is incorrect as ROM editor to put out what is not available on the screen. Line number check for spoken lines has become effective also in FE7U. 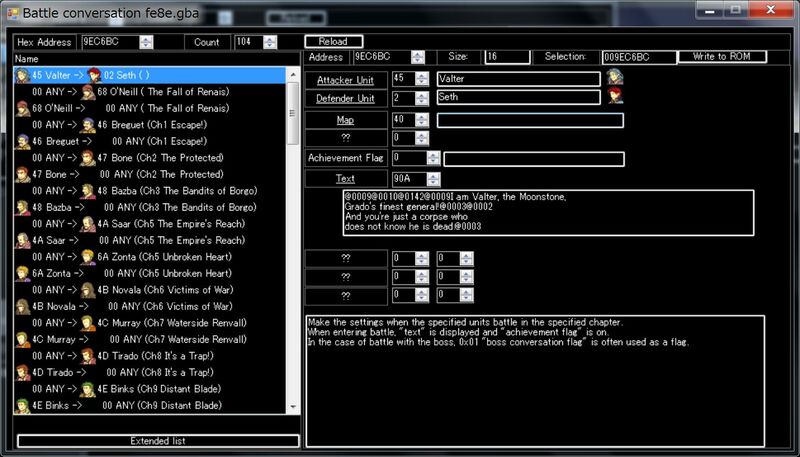 In addition, an option was added to the setting screen. 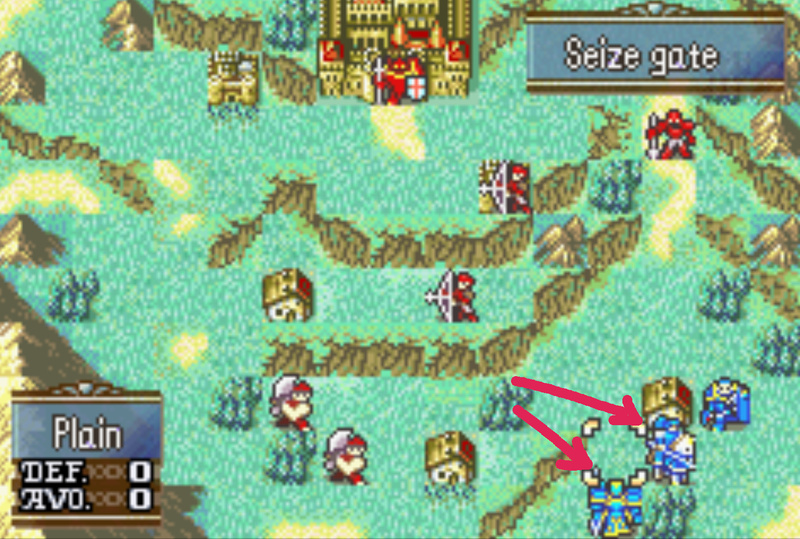 FE7U, FE7J, and FE8J each have only one location, there are bugs in which the conversation is three lines. Detecting a bug from this source is troublesome, so default bug detection will not be done. 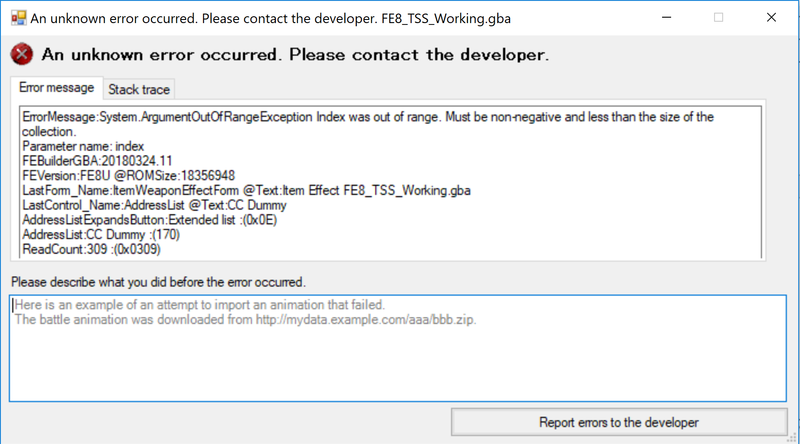 Otherwise, if there is a part where the text of the conversation is three lines, it automatically detects it as an error. 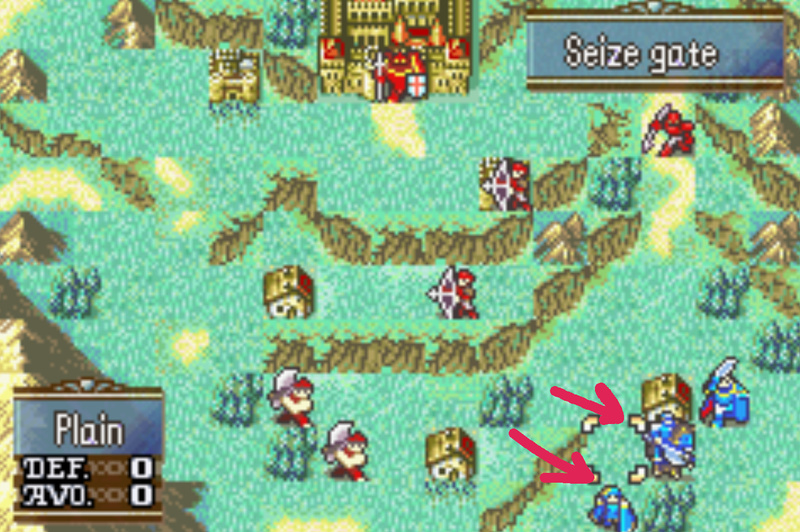 If you are concerned about where a bug from the FE7U is, please try (3) and run Lint. 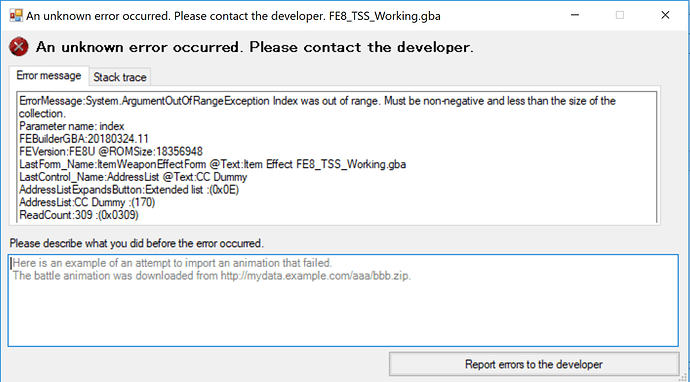 If you do not want to detect the number of lines of text as an error, please use (0) or (1). Currently this feature is disabled for Chinese localization. It is because I have not yet acquired font data. 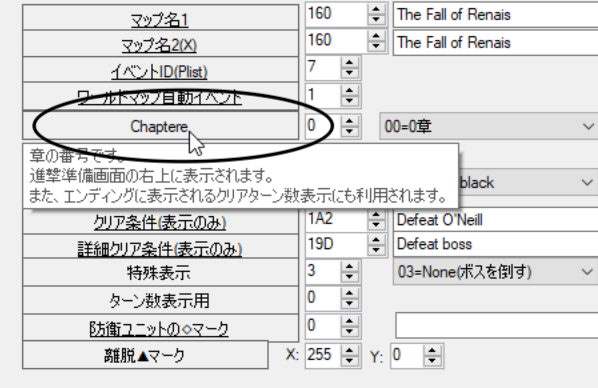 In the “Chapter Data Editor” the circled text is “Chaptere” for both Japan and English. 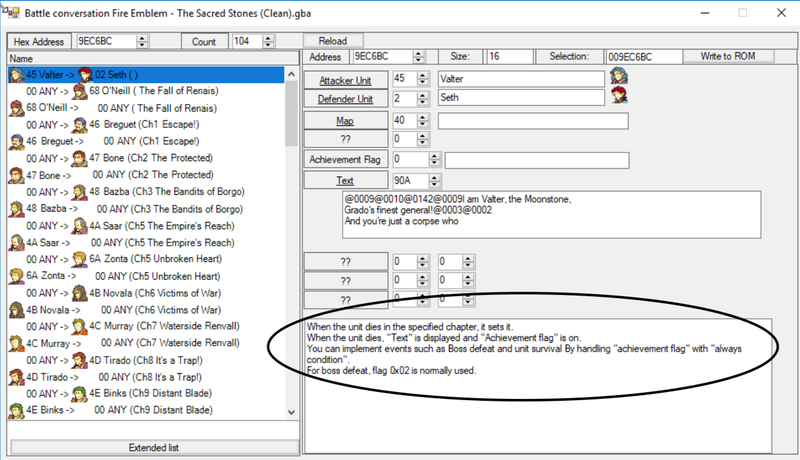 In English it should be “Chapter ID”. This is more of an ask, but could you please move import/export text into another tab in the text editor. Right now they are in the search tab and it feels unintuitive. I may have found a bug with the Class Expansion patch. The classes beyond 127 load and work fine until a game over occurs. When the level is loaded again after the game over screen any classes past 127 change class. The Level starts with the correct classes. When a game over is trigged and the level is restarted they change class. Please tell me more information to reproduce. What is the address of the image? What kind of image is it? Do you use TSA or not? What is the address of the palette? 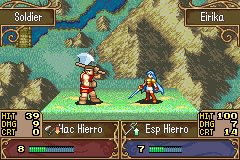 Which FE6 do you use? FE6J,FE6U,FE6CN? I want to check all the settings of the graphic tool when importing. If you publish a screenshot of the graphics tool, you can solve all these questions. Also, Can you publish images you want to import? If you can publish the image, I would like to use it and test the operation. Does not occur at game interruption? If it does not occur due to interruption, data loading at the time of game over will be executed in a completely different process from interruption. I have erased the image that you can not use. Then, the value in the item column on the right was missing. From this we can see. This image seems to be an image used for the item column on the right side. I think that it is not an unusable image but an image where the available places are limited. This data area is necessary. However, it seems that the usable range is limited. *Edit: I was able to get around this by re-pointing it and “expanding” it down to its original size, and then expanding it again. Let me know if you’d like me to try to look more into what caused it in the first place. Let me show you a better example. 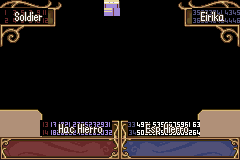 Tiles 15, 16, 47 and 48 don’t appear anywere, and the tiles 61, 62, 63 and 64 show garbage. Can you send me ROM ups data? Perhaps, it is an error that occurred in the drawing routine. But I do not know why the “value” is negative. If we erase 15, 16, 47, 48, the number will be shifted forward and the screen will be corrupted. I think that it is meaningful that there are unusable tiles. Both occur in the area at the end of the image. For some reason, it can not display tiles in this area. 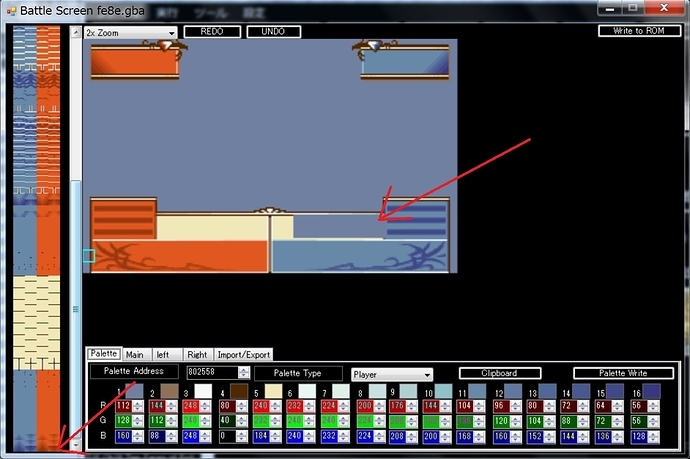 I think that it is specification of GBAFE whether the tile can be displayed or not. 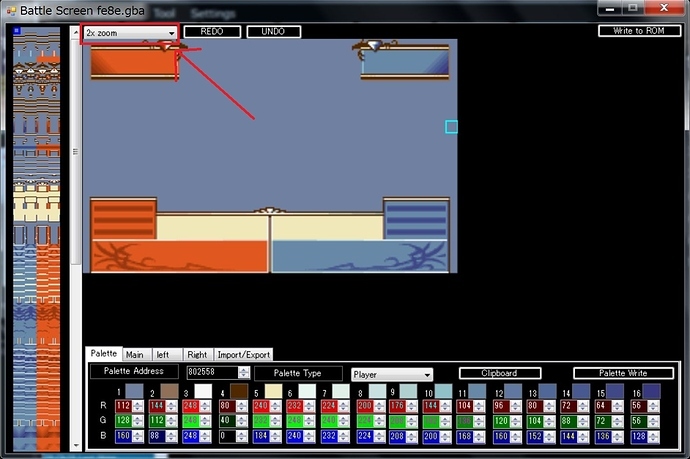 Each tile’s tile can not be displayed on the screen for some reason. But it makes sense for that tile to have that number. I may have to issue a warning that tiles can not be used for unavailable tiles. I will issue a warning on a pop-up message or something. 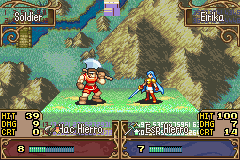 I’m using a special version of FE6U with accented letters (é, à, ç, è, etc…) to make a French translation. 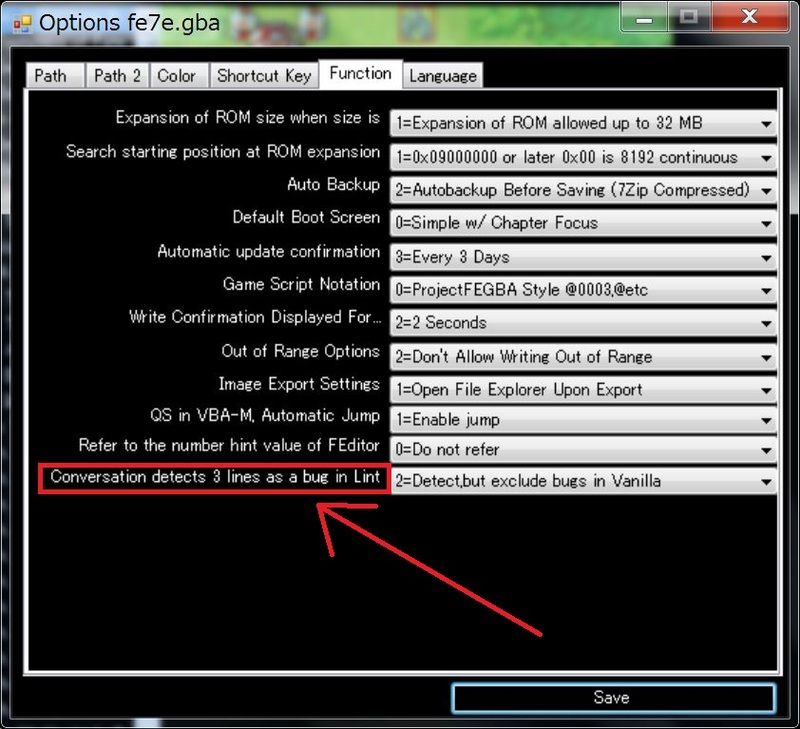 When I use ‘FE BuilderGBA’ , I think ‘FE BuilderGBA’ is really great ! So I’d like to ask if it’s hard to get ‘Chinese’ font data. Thank you for sending the graphic tool data. I think that the image of “LevelUp” has been replaced correctly. However, the image you are rewriting does not seem to be used in the game. I think there is another “LevelUp” image. But I could not find the position of the image. The image used in the game seems not to be an ordinary compressed image. The image you are rewritten is only referenced in the routines below. However, setting a breakpoint in this routine does not work well. Even if I set a breakpoint in “0x08013ca4 CopyDataWithPossibleUncomp” which is the unlz77 routine, I could not find the image of “LevelUp”. I think that this image has a special storage method. Chinese fonts are using their own storage method and are not yet accessible. In Japanese version, FE use hash + List structure by using 1st byte of SJIS as font storage method. However, people who made Chinese translations ignored this structure and created their own font system.